The much loved structure was closed in early June after large seas lifted the 150 year old Iron Bark deck up off its pylons. Recognising the tourist, recreational and historic appeal of the Wharf, Bega Valley Shire Council has been working hard to restore access. Director of Engineering Terry Dodds, said full access down the main timber ramp on the eastern side of the building is still a little while off. “Until then I am very pleased that Council has been able to establish safe access via the walkway along the western side of the Wharf,” Mr Dodds said. The Pig and Whistle Museum will also be able to open again, however the Locavore Café are planning to stay closed until September 1, in line with their winter trading plans. 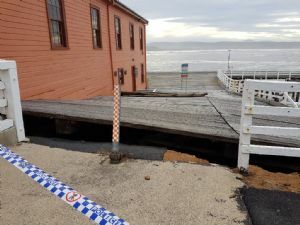 “This partial access is a win for the community, while Council continues to work with the owners of the Wharf to plan for the major repair works that are needed to ensure the structures’ future,” Mr Dodds said. The Wharf is owned by the NSW Government but managed on behalf of the community by Council. “It’s hard to say when the full suite of works needed will be completed,” Mr Dodds said. “Council appreciates the community’s patience during this necessary process.” Mr Dodds said. The final figure on the cost of the works will be in the millions of dollars and how that will be funded is still being explored with the Baird Government. Until the eastern side is made safe, Bega Valley Shire Council asks that people stay out of that fenced off area. Access to the Wharf is via the timber walkway on the western side. Photograph: The damaged section of Tathra Wharf, on the eastern side of the old warehouse.